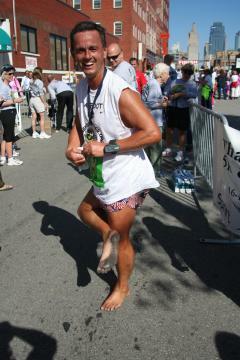 BOSTON -- A man from Missouri will run the 109th Boston Marathon barefoot to raise money for the Free Wheelchair Mission. Rick Roeber has been running marathons barefoot since 2004 and using his Soles For Souls donation drives, he has raised money for many different philanthropy organizations around the country. "My barefoot running brought me some publicity and I wanted to do something good with that," said Roeber. "I'm running to bring awareness to the disabled around the world and as a statement of my faith in Jesus Christ." Roeber began running barefoot after his knees started to bother him and he learned that running barefoot could improve his running technique. Once he had made the transition out of shoes, his knee problems were alleviated and he's been running barefoot ever since. This year's Boston Marathon will be Roeber's fifth time in the race. The first three times he ran with shoes and the following two without. He said he plans to complete the race in under four hours and looks forward to experiencing the energetic Boston crowds. "I just want to hear people say, 'There's Barefoot Rick and he's raising money for the Free Wheelchair Mission.' That's my goal," said Roeber. Roeber and the Free Wheelchair Mission were first introduced to each other when he ran in its Run for Mobility marathon in Huntington Beach, Calif. Since 2008, Roeber has been working to raise money for the Free Wheelchair Mission. "When I read about its mission it really struck my heart," said Roeber. The Free Wheelchair Mission provides wheelchairs to people in developing countries around the world in need. It was founded in 2001 and last year distributed over 80,000 wheelchairs. "We are so excited to be working with Rick," said Ashley Herron, events coordinator at the Free Wheelchair Mission. "We rely on volunteers like Rick to champion the cause." The Boston Marathon will be the 43rd marathon Roeber has run barefoot.